A careful analysis of the site context and the building in its former use revealed a potential "desire path" - an instinctual or natural route a pedestrian would take across any given site if their route was unobstructed, a path which is determined, shaped and affected by a variety of external factors, including destination, environment, light, shade, noise, protection. The path runs roughly diagonally across the site from Bridge Street to the Boulevard. Indeed, in its former incarnation as a department store, the interior did provide a cool, shaded shortcut and a brief respite from the street, and in turn the department store no doubt benefited from the additional exposure of its goods to passers through. This path was however somewhat limited, and as an 'accidental' as opposed to defined path, it was not optimised for the benefit of the operation. The new design deliberately uses the desire path concept to generate its layout: The pedestrian routes are designed and enhanced for a more natural flow through the building to maximize the display ,and exposure of goods and services on offer and to negate the dead-end phenomenon. This creates a natural ,internal shopping arcade: here glass shopfronts open up onto the arcade creating a near seamless shopping experience, and the arcade extends with a seamless transition to the street with the use of air curtains instead of doors during opening hours, encouraging pedestrian traffic. At the intersection of the pedestrian routes is a vertical device designed to draw the eye upwards. The 'Vortex' is a circular atrium bringing natural light into the heart of the arcade - where once was a dark unwelcoming interior, will be a dramatic space bringing light into the core of the building. Visually, the 'Vortex' is both a spatial intervention in the building and the desire path escalators, crisscrossing as they move from floor to floor. The open space of the 'Vortex' is designed to be dynamic, one of movement and interest, creating visual linkages between floors. It creates an awareness that there is more happening on the other floors, inviting one upwards to explore - in essence sucking traffic up into the building - as its name suggests. 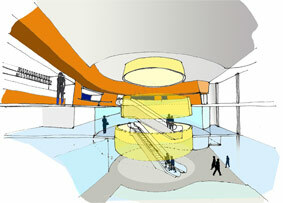 On the first floor a circular gallery runs around the 'Vortex', with shopping radiating around this core. The circular layout of the units gives display frontage to all passing traffic through the 'Vortex', again maximizing exposure. The circular gallery also lends itself to one wishing to pause for a casual browse on their way through the building. The gallery opens to full height glazing overlooking the Bridge Street, bringing in natural light in addition to that brought in from the atrium, enhancing the shopping experience ­and in turn reducing lighting costs. The crisscrossing escalators are designed not only to create a sense of dynamism and movement within the 'Vortex', but are so laid out to create a pause in upward travel at the circular gallery, where visitors traverse the gallery to ascend the next escalator giving further exposure to the merchandise and services on display. ... and so on Friday evening you make your way into the dramatic 'vortex' foyer of the Blue Coral with your date. This time you don't take the escalator, but instead the lift, up to the third floor. The lift opens onto a surprise - a serene outdoor bamboo courtyard. Designed to cater to the business or executive lunch trade (Why suffer through traffic for half of your lunch hour, when you can lunch at the Skygarden), as well as shoppers during the day, and fine dining in the evening, the Skygarden will be a unique experience - a quality restaurant in the heart of the city, yet away from the hustle below. On one side the terrace will embrace a view over the Boulevard and across to the harbour, and the opposite side will open to a landscaped roof garden. The perfect place for business lunches, or for shoppers wishing to take a break, the SkyGarden will be one of the daytime attractions of the building, a fashionable rendezvous point, drawing patrons up through the heart of the shopping centre, to enjoy an experience that one typically has to leave the city for. In the evening, it will cater for pre-theatre diners taking in the lights of the city, or intimate dinners for two at the bamboo garden. The SkyGarden is an integral part of the experience concept. At night the main 'desire path' on the ground floor is closed at both ends with roller shutters for security, and the entrance and exit is exclusively via the middle entrance on Bridge Street - forming the 'Vortex' lobby. An unobtrusive concierge/security/information desk in the foyer creates a control point, and patrons are free to casually browse the merchandise on display in the shop fronts as they make their way up to the entertainment level. 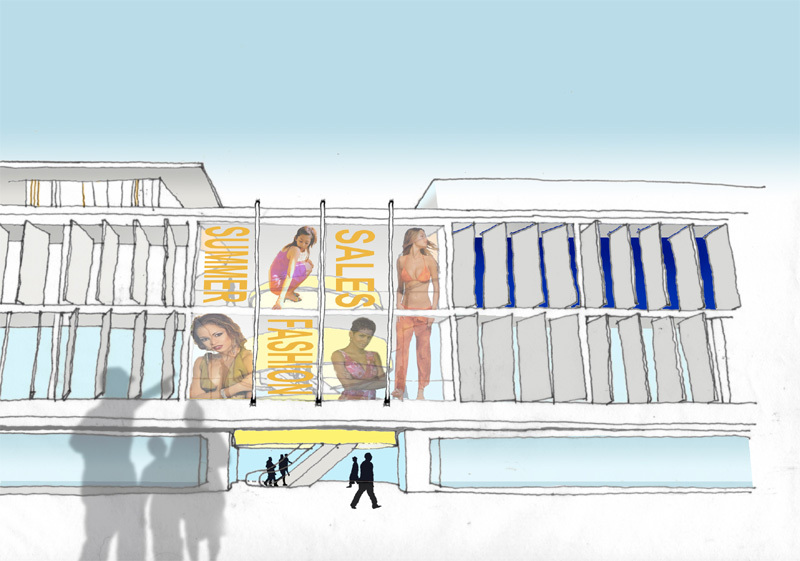 Again the design allows for maximum retail/display exposure for the tenants, even at night. The escalator arrives at the swirling gallery foyer around the atrium of second floor entertainment level, near the ticketing and reception desk. To the right will be the cinemas, housed beyond the slanting curving wall of the foyer. On the opposite side of the gallery foyer from the ticketing desk is a fully glazed frontage overlooking Bridge Street, allowing patrons to see and be seen as they mill about the space. Here will be a transient seating area for cinema patrons waiting for friends, grabbing 5 minutes before the start of the movie, or perhaps drinking a coffee pre-theatre. Off the foyer is the sophisticated atmosphere of the lounge bar, with its backlit space and its unique conversation tables. Semi circular banquettes occupy the spaces in front of the vertical windows overlooking the Boulevard, and the custom designed seating will encourage a relaxed, convivial atmosphere. A staircase, designed as a sculptural backdrop to the lounge bar space, leads to the SkyGarden restaurant. Castries requires a catalyst to attract life back into the city in the evening. Simply put, the proposals for the second floor of the Blue Coral building will house two cinemas, a studio theatre and a lounge bar, but the design is not just about what it can accommodate - like the lower floors the proposal has been carefully designed to create an experience, a place. A place where people can meet, socialize, partake in local theatre or international cinema. 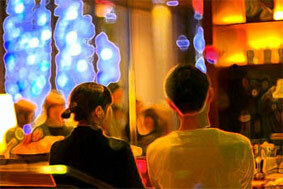 A place where a couple can go for an intimate dinner, or old friends can socialize in a relaxed setting. A venue designed so that one can spend the whole evening, enjoying all, or just one of the experiences on offer - a destination in the city. Often neglected in urban proposals, the landscape surrounding the building is often a significant factor in the success of the building. The approach to the building, and how it is integrated into the urban fabric is the first experience of any visitor to the premises. The proposals centre around creating a wider circulation space around the Boulevard entrance to the building. The sidewalk is expanded out into the street, occupying the space now permanently occupied by cars and key-cutting vans which currently obscure the entrance to the building. The expanded sidewalk area incorporates semi mature trees, and street furniture - litter receptacles etc. The 'reclaimed' area will be rough cobbled between the trees to discourage vendors setting up. This will create an unobstructed view to the glazed shop displays. The alleyway between the property and Cimpex is also 'reclaimed' - a small piazza is created through repaving, extending to the side entrance of the building, and screened from the parking beyond. This space will also be tree lined and will be colonised by the tables of cafe/sandwich bar, integrating the building and the streetscape, and bringing more life to the building. The proposals for the urban landscaping are seen as part of the initiatives proposed for the Boulevard and Castries. Today's buildings should be designed to be as environmentally and energy conscious as possible - this not only has obvious benefits for the planet, but the significantly reduced running costs benefit the bottom line of the client: the profit margin. Careful design also negates incidences of SBS (sick building syndrome) by reducing or even in places removing the necessity of air conditioning. The elements of proposed concept, from screens to atria have been designed from the outset with energy awareness and building comfort in mind. The proposed building use is more space intensive than the original layout - with perimeter-situated concessions. The cross flow of air, and light penetration will therefore be interrupted or obscured in many places. The introduction of the Vortex atrium and full height glazing above the main Bridge Street entrance at the Vortex lobby will bring light into the heart of the building. The deep penetration of light into the building will reduce dependence on artificial lighting, whilst Sunpipes or similar are proposed to channel light into darker areas of the building further reducing lighting/energy costs. The vortex atrium is also designed to enhance the- 'thermal stack effect', where cooler air is drawn into the space whist warm air rises and exits via the atrium, helping to keep the building cool and reducing the air conditioning loading. Dependent on further investigation, it is proposed to use a 'chilled beam' system for integrated and efficient lighting/cooling installation, where the cooling could be driven by heat exchangers using the water table of Castries. Externally, the new signature feature of the perforated anodised aluminium screens along the west and north elevation will reduce glare and solar heat gain to the building, whilst still allowing air flow, moderating the internal climate. Whilst the building has aged badly in its half century of existence, from the competition stage it was felt that the existing structure basically had 'good bones' and proportions. Hence the design does not seek to deny or contrast the existing proportions, but seeks to utilize and enhance the buildings best features as the basis of the design, whilst updating it for the 21st century. At the ground floor level the existing cantilevered canopy, which gives generously on to the street, providing shade and shelter is retained and refurbished, and extended at the comer of Bridge Street and the Boulevard. The glass display boxes along Bridge Street are retained and updated, whilst along the Boulevard, a new frameless glazed facade to the shops, large door panels to the cafe allowing it to open to the street, and refurbished entry steps, will give this level a fresh look. Above, the body of the building is to be clad with a colour coated aluminium rainscreen system, providing a durable low maintenance solution to the elevations, and it is the details of the design that will bring the building to life. In keeping with the cohesive design strategy, where the aesthetics are part of the functional design of the building, and V.v., the solution to solar heat gain, daylighting, and passive ventilation becomes one of the buildings' signature features. Along Bridge Street the existing cellular concrete block screen in the large opening on the east facade will be replaced with a series of perforated anodised aluminium screens, with the glazing retained behind. The screens are designed to provide shade and protection to the windows of the facade, preventing direct solar penetration and excess heat gain to the building, whilst facilitating light and ventilation. The screens will be installed in a series of panels, where each panel will be individually operable and allow adjustment to match the track of the sun through the year. Between the screens, the merchandise behind glazed shop fronts will be visible - something that was not possible with the original building. The operable screens will also be able to be shut to protect the glazing from hurricanes. Aesthetically, the vertical emphasis of the screens creates a rhythm along Bridge Street, whilst the perforations of the screens create a visual lightness - the screens become a series of diaphanous veils along Bridge Street that change in translucency, sheen, and fonn as one moves along the street. The existing north facade facing the Boulevard has an almost classical rhythm created by the vertical openings of the first and second floors. The new design emphasizes this feature by stripping out the existing windows and redesigning the fenestration to create double height 'vertical display strips'. On either side of these 'display strips' will be full height, perforated anodized aluminium screens, similar in construction to those along Bridge Street. Again these are designed to shade the glass 'display strips' from excess solar heat gain, and also to provide a dramatic emphasis to the facade, enhancing the classical sensibility, and creating a strong presence for the building from the street. Whilst the new screens hark back to the Caribbean jalousie shutters of the past, they are finnlyrooted in the 21st Century, with the design, materials and durability. Despite the aforementioned classical rhythm, the existing building lacks a crowning element - a cornice or pediment. Here the louvred canopy of the new fourth story Skygarden restaurant will create a dramatic floating plane over the comer of the building at Bridge Street and the Boulevard, completing the building proportionally and, in giving visual emphasis and prominence to the Boulevard / Bridge Street comer, it cements the buildings status as both a landmark and a destination in Castries, finally announcing its presence as the hub of Castries. During the day, the innovative architectural design will create a unique landmark for Castries. At night the building is transformed by light - the perforated screens of the building glow with the illuminated 'display strips' and glazing behind, adding drama to the building, and the canopy of the skygarden becomes a glowing plane of light hovering over the building. The seductive curving form of the Vortex becomes clearly visible through the double story glazing to Bridge Street, and one can see the 'live theatre' of people rising up to the cinema level on the escalators, and milling in the foyer. An integrated lighting scheme for the building will be designed to create a unique display on days of celebration such as Independence Day, Christmas, Festival of Lights etc. ingraining the building into the general consciousness, and further integrating it into the urban and social fabric.